When planning an old house renovation, many people debate the virtues of paint versus stain. If the paint is peeling, do you strip it off and repaint or go with a stain? While many people simply go by personal preference, there are historical guidelines as well. Here’s how to look for clues in the period when your house was built. 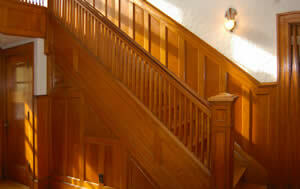 In many houses built before the 1900s stain was used to bring out the best in high quality wood. Many houses built with rich oak, walnut or birch trim and windows featured rich stains to highlight the grain and accent other architectural elements in the room. Many Victorian houses, for example, featured grand rooms with ornate crown molding and 10-inch baseboards. 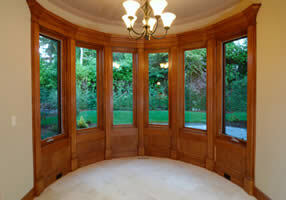 What better way to accent the thick, tall moldings than with a rich mahogany or walnut stain? How about showcasing burgundy or green stained glass details with a contrasting trim color? Some houses built during that time did feature paint, however. During the late 1800s, for example, many contractors used dark paint colors to showcase the details in their houses. At that time, the exterior trim often was painted darker than the siding. 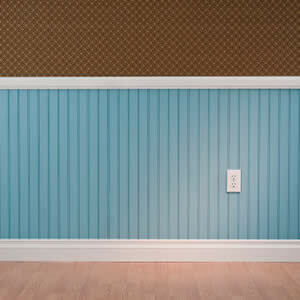 During the early 1900s, lighter colors became popular, particularly for trim. If your house currently features stained trim that is either failing (from a bad application or exposure to the sun, for example) or unappealing to you, then you face the decision of whether to restain or paint. Sometimes the choice is made based on the condition of the wood and the stain. If you have minor surface scratches that can be lightly buffed with steel wool, then it would be easier to restain those areas and resist the urge to switch to paint. If the stain is bubbling and needs to be removed, then you are starting from scratch anyway. At this stage, think about the look you want and how it relates to the history of the house. Another factor to consider is how unified the house is. Do you have stain in some areas and paint in others? If 75 percent of the woodwork in the house is painted and the wood is not highly decorative, then it might make sense to paint the rest. The time, expense and the thought of sheer exhaustion can be a powerful influence on home renovation decisions! The decision to stain instead of paint sometimes comes down to who will be doing the work. While staining can be a learned art, it certainly requires a different sort of finesse than does paint. If you plan to hire a painting contractor, then it may not be a concern. If you plan to do the work yourself, consider your skill level and temperament, as staining does require a little more patience. The quality of the wood also should be factored into the equation. Not all old houses feature thick oak window casings and solid oak doors. Some houses were built by contractors who wanted to use all the inexpensive pine they could find. As pine is softer and does not take well to stain, the best solution is to paint. On the other hand, if the trim is weighted down by too many layers of paint, you may have to strip it and start over. (Follow guidelines for working with lead paint, as you can assume that most old houses have some of it!) Once you remove paint from a few areas you’ll be able to judge whether it is worth the effort to take things down to the bare wood. While stain has its place in many old houses, some housing styles are a natural foil for the various colors paint offers. The bold painted lady Victorians are a prime example. While there are many different stain colors, no combination could match the drama created with five to seven paint colors layered around the various exterior elements. When trying to determine whether the woodwork in your house was originally stained or painted, look around the neighborhood for clues. Check with a historical society or neighbors who might have old pictures to share. You also can have the paint analyzed, a process that can dissect the layers and tell you all the color. While it sounds noble to say you will flake off a few paint chips, have them analyzed and recreate the original paint theme, it may not fit your tastes. Paint colors have evolved considerably over the years, making the more muted Victorian colors seem, well? a little dated! The decision to go with paint or stain can be difficult. You’ll want to spend time analyzing how the woodwork is treated throughout the house and looking for historical clues for guidance. Also think about your long-term renovation goals; how long you plan to stay there; and the time, energy and money you can sink into it.